Liverpool and Chelsea face off in the League Cup tonight at Anfield. The glamour tie of the round will be complete tonight, with one of the current top three clubs in England departing the competition. If it goes the distance tonight there will be no extra time - the 3rd round games going straight to penalties in an attempt to ease early season fatigue on teams in a busy part of the season. Both Jurgen Klopp and Maurizio Sarri are likely to make changes to their line ups, both teams play again at Stamford Bridge at the weekend, and Klopp has already signalled that changes will start from the back. Simon Mignolet will play his first game of the season. With both teams involved in a competitive start to the Premier League, and adventures in Europe, this competition may not be central to their plans. Butthe Liverpool fans will certainly hope the reds can add to their record 12 final appearances and 8 trophies in this tournament. There are a total of 6 Premier League clubs involved tonight. Everton v Southampton will be played next week. 8 Premier League teams were in action last night, with 5 progressing to the fourth round. Burnley were beaten away at League One Burton, Wolves were beaten on penalties by Leicester and Man Utd were beaten at home by Derby County of the Championship. Huddersfield, Brighton, Cardiff and Newcastle were all knocked out in the 2nd round - that round doesn't involve the Premier League teams competing in Europe. A maximum of 10 Premier League teams will be heading into the draw for the next round. Well, Klopp did say he would make between 1 and 11 changes for this game. The lucky number is EIGHT changes for the reds. Fabinho makes his first start as a Liverpool player. Liverpool: Mignolet, Clyne, Lovren, Matip, Moreno, Fabinho, Milner, Keita, Shaqiri, Mane, Sturridge. Substitutes: Grabara, Firmino, Salah, Gomez, Henderson, Solanke, Jones. Seems LFC's social media channels release the LFC team a bit before the teamsheets are submitted. Not sure if it gave enough time for a tactical Chelsea advantage. The reds play Chelsea tonight, and of course also play them at the weekend in the Premier League. Last season, Liverpool face the same situation in the third round but then the reds took on Leicester twice. Liverpool lost the League Cup fixture but went on to win the Premier League encounter. Much has been made about Liverpool's great start to the League season - it's our best start since the 1990/91 season when we won our first 8 league games. But for the League Cup Liverpool will be hoping to avoid being knocked out at this 3rd round stage for the 2nd successive season. And the last time the reds suffered two straight years of 3rd round exits....? 'I would have picked the same team tonight (even without it being Chelsea). We have a couple of problems here and there, Van Dijk and Gini. Naby has to play tonight. That's the line up. Dejan Lovren also back tonight - it's his first game since the World Cup Final. Fabinho debut. Potential for a debut for Curtis Jones. 4' Corner for Chelsea in front of the Kop. Christensen rises the highest but it's an easy catch for Mignolet. 4' And Keita picks the ball up outside Chelsea's area, unleashes a shot but Caballero has that one in his sights. An early chance for both sides. 7' Moreno concedes a free kick just outside the area. Dangerous position here for Chelsea. 8' Willian balloons that free kick over the bar. Poor effort from a decent player that. 10' Lovely turn by Shaqiri at the edge of the box but the turn and shot was denied. Naby Keita now in the penalty area - suggestions that there may have been a handball. 10' Moreno concedes another foul - this time on the half-way line - brings down Moses. 11' Ross Barkley frees up some space about 30 yards out, he turns and attempts a long range shot at Mignolet. It's not on target and goes wide of the goal. 18' Morata with a great chance. He gets past Lovren and then it's a fairly dodgy looking 'save' by Mignolet. It allows Morata a second bite of the cherry but his shot squirms along the goal line. 20' Morata with another shot. 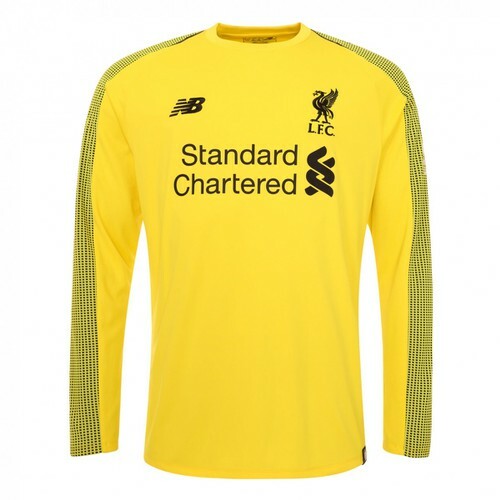 Saved better this time by Mignolet. 21' James Milner picks up the first yellow card. Chelsea have started the brighter in this game. Morata getting plenty of joy out of this second string LFC defence. 26' Now Matip joins Milner in the book. 30' Moreno goes for a tackle inside the area. Appears to have done himself a bit of a muscle knock. 31' Shouts from a penalty from the crowd. Gary Cahill swung a leg at Keita in the area but Keita may have pre-judged that one and gone down before any contact. 36' That's the second time in this half that Fabregas has handled the ball inside the area. Ball hit at him but he did move his hands instead of just chesting the ball. 37' Rocket unleashed by Naby Keita, and Caballero forced into a fine save to put it out for a corner. 39' Much better from Liverpool. Shaqiri with a great cross and Mane should have done better with that header. Caballero gets a hand on it. 44' Overhit shot from Shaqiri - well well wide. Chelsea the better side for most of that half. Liverpool improved massively in the final 10 minutes of that half. Remains 0-0. Plenty of chances - but not quite as clinical as these two teams' first eleven's could manage. Both Arsenal and West Ham are leading at home against lower league opposition. The other all Premier-League tie, Spurs v Watford is also 0-0 at the moment. That one kicked off 15 minutes later. Rare starters for their clubs this season. 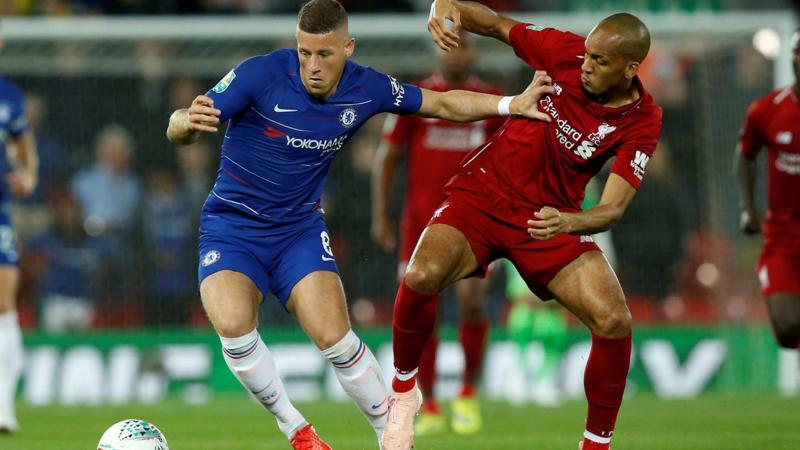 Ross Barkley and Fabinho engaged in a midfield tussle. Liverpool kicking towards The Kop in this half. Straight from kick off and Sturridge is through, he's past the keeper who gets a bit of a touch. Swings a boot at it and it's gone wide. He had more time there. 51' A rare free kick awarded LFC's way after Milner is fouled by Kovacic. It's some way out and it was a long punt to try and find Lovren's head. Caught by Willy Caballero. 52' How are Chelsea surviving? Ball comes back through into the area after a poor backpass header by Barkley. Mane's in but the space is closed. And from the corner, Lovren in for the header. Off Morata's head. Another corner. 54' Eden Hazard about to come on for Chelsea as Sarri takes this up a notch. Fabinho gets a yellow card. Fairly inocuous challenge, but Kevin Friend had just spoken to him. 56' Willian heads off and on comes Eden Hazard for the visitors. 59' DANIEL STURRIDGE scores. Keita in the area - fires at the keeper who can only palm it away. Daniel Sturridge with the overhead kick into the net. 60' James Milner makes way and on comes Jordan Henderson. 61' Liverpool look in the mood now. Shaqiri again - attempts a shot from outside the area. Over the bar. About 30 minutes left in this game now. 65' Another of the big boys for Chelsea comes on. N'Golo Kante replacing Mateo Kovacic. 70' Sadio Mane heads off and is replaced by Roberto Firmino. Apologies for the lack of updates towards the end. Signal issues at Anfield.